If you’re goal is the increase your energy, you need to think long term and not an instant fix. Yes, grabbing a donut at a coffee shop will give you a quick boost. But it will also provide you with a lovely crash forty minutes later. Not exactly a great plan. And while I am all about natural sugars like those found in fruits, eating a piece of fruit by itself (instead of pairing it with a protein or fat) will still leave you crashing minutes later. So instead of bumping up your energy with store bought junk, learn to increase energy naturally and reap some health benefits while you do it! The best way to stay bursting with energy all day long is to regulate your food intake! Ensuring you are using food as fuel will go a long way in keeping your energy going. So, if you normally hit an afternoon slump, take a peek at your meals from lunch up. Were they filling? Are you not eating enough.? Low intake is a common one when I chat to initial nutrition clients. Make sure you’re giving your body the fuel it needs. And, as I already touched up- quality matters! If your morning meals consist of a bagel for breakfast, fruit at break, some coffee and then a burger, you’re probably not giving your body what it needs. Focus on nutrient dense foods and go from there. I personally love to have some energy boosting, nutrient loaded snacks on hand for just these occasions- like these chocolate coconut energy balls! macaroons or even energy boosting cookies! Many people overlook drinking water when it comes to energy, but it’s a big one! If you’re dehydrated (keeping in mind that if you notice your thirst, you’re already dehydrated) your body won’t really be up to focusing on your energy levels. One of the reasons people forget about this crucial tip is because they think they are hydrated. A coffee in the morning and some juice before lunch though isn’t overly nourishing. And the juice just comes with a sugar crash fyi. Focus on boosting your water intake (here’s a few tips on increasing your water intake) and you can increase energy naturally. Tea is also a great way to stay hydrated. You can read more about the benefits of loose leaf tea in this blog post. Yes, moving can INCREASE energy (not just leave you in a sweaty puddle on the floor ? ). While regular workouts are great. If you’re feeling low in energy, just move. A walk outside in the sun, some dynamic stretching in your office, anything to get blood flowing will help you boost your energy short term. If you need a super speedy energy hit, getting outside can help! Breathing in fresh air and (ideally) sunshine can have a huge impact on your mood and energy. No need to stay out all day, but a brisk walk around the block can do wonders. Funnily enough, this was one of the reasons I got a pup! While I’m an active person, I do tend to hibernate in Canadian winters. Having a dog forces me to get outside and I find I’ve more energy and am happier because of it. This is an area of life no one wants to actively work on. While people will at least attempt to do more exercise and eat better, most people just accept or downright refuse to change their sleeping habits. And yet, sleep plays a crucial role in your energy levels! It’s during sleep that our body recovers, resets and grows. This is insanely important. And without this sleep our body uses hormones to tell us something is off. These hormones can make our energy levels low, they make us crave more sugar etc. Sleep is crucial if you need to increase energy naturally. The hard part about this is that your sleep should happen at specific times (I believe 10p-6am is where the most recovery happens but double check!) and yes, it shouldn’t be interrupted. Obviously, the interrupted part is hard to do if you have kids- which is why there’s a few other options for boosting energy below! Like every other area of life, people are always looking for a “quick fix” to an aliment. Truth be told, much of the time quick fixes don’t work and more often than not they leave you with other problems to solve. But coffee, coffee for moms is pretty much a life source ? And while I do adore my daily cup off coffee, I am a huge believer in choosing the healthiest option you can… and coffee isn’t it! Enter Matcha. I’m sure by now you’ve heard it Matcha. It’s a green tea and it’s potent. It’s a natural way to increase energy as well as touting a few other amazing benefits (it’s high in antioxidants, it can help boost your metabolism, your immune system etc). Matcha. Is. Wonderful. But do you know what’s better? 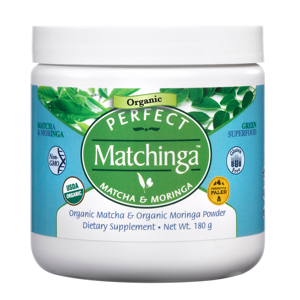 Matchinga is a combo of Matcha green tea and a fun little superfood called Moringa. Moringa has long been touted for its powerful nutrition properties. This amazing superfood has even been said to lower blood sugar levels, reduce inflammation, lower cholesterol and boost antioxidant content. So, combining it with Matcha green tea makes this my new favorite powder. Not only is it green (who doesn’t love color?!) but thanks to the green tea aspect, it’s a natural way to increase energy! This green powder has quickly become a favorite of mine as it definitely helps combat that afternoon slump (though I can’t stress enough that it’s still important to figure out the cause of the slump and not just the quick fix!). It has a nice pick me up similar to that of coffee, but it also comes with an insane amount of health benefits. And what fun would it be if you used just the powder?! Instead, get creative and whip up some of the awesome recipes below (like these yummy Matchinga based macaroons). Not only will you get your energy boost, but you’ll also be giving your body the nourishment and fuel it needs. All of these recipes are LOADED with nutrients. Bake at 350 for 13 minutes and let cool on tray. Don’t forget to pin these tips on how to increase energy… naturally! Keeping energy levels high involves more than grabbing a cookie and a coffee each day. Focusing on nutrient dense foods, staying hydrated and getting enough activity and sleep all play into your energy levels. And if you do need a mini pick me up (let’s be honest, we all have those days!) opt for a health boosting, nutrient dense snack!